What Are Fall Wardrobe Necessities? It’s hard to believe that it’s September 1st and fall is just around the corner. It’s time to think about digging out the fall wardrobe. Time to see what fits and what goes into the giveaway pile. If you’re anything like me, you will look for any excuse to spruce up last year’s wardrobe. Who doesn’t want new clothes? In general, I lean toward classic items that will last more than one season. I live in the Southeast where the weather changes on a dime; I want to be sure that I am covered even if we get rain, snow or 70-degree temperatures all in the same day. This is especially important if you have travel plans and have a limited selection on hand. These fall wardrobe essentials get me through every autumn in comfort and style. I love a good shawl. This isn’t the old-fashioned type your grandmother wears but rather an all-in-one item that converts into a scarf, wrap, etc. Soft, light and fashionable, a shawl travels well, can be easily stowed and work as a pillow in a pinch. Not a shawl person? 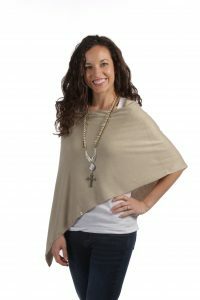 Consider a poncho or an oversized scarf for the same purpose. Waterproof jacket with removable liner. The first time I went to Europe I took this type of jacket and it was the best move I made. A waterproof jacket protects against rain, fog, and damp weather, plus the removable liner can help you to adjust to varying temperatures. This is my absolute must for any fall wardrobe. Boots. You can opt for fashion boots or something a bit more rugged depending on where you’re likely to go on your daily travels. Again, waterproof if the best option; particularly if you take long walks in the woods as the leaves are changing colors. Sweaters. I’m a huge fan of a cotton sweater. 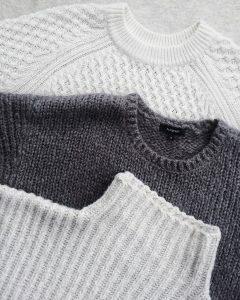 They are the warmest, breathe well to help you adjust to variable temps, and can be worn over a t-shirt or turtle neck. A cardigan works equally well. Lightweight gloves. Generally, I’m not a big fan of gloves. I love my lightweight gloves because I can function while wearing them. Lightweight synthetic material keeps my fingers warm, they are lighter, and easy to store in a pocket or bag. Good socks. I’m a barefoot girl most of the time. When it starts to turn cold, I head for my sock drawer. Being out and about with cold feet is not my idea of a good time. My top two suggestions are wool socks, which will certainly keep your feet toasty. For those of us that can’t wear wool, I nominate heavy cotton socks. Synthetics are ok around the house but if I am wearing boots all day, I want to make sure my feet can breathe. Thermal anything. Are you a sports fan? If you are and don’t thing a Snuggie is fashionable outdoor wear, choose some of the latest items in thermal wear. These aren’t your granddaddy’s long johns, but fashionable, cozy additions. What are the items you can’t live without?